Pac-man, the biggest arcade game of all time, turns 35 today. Launched in the early 80s, a time where most arcade games were war-themed or Pong copycats, Pac-man entered the arcade arena with a different offering. The goal of this new non-violent game was simple: eat to win. No weapon-based attacks, no kicking or punching, no blood or sweat. The universal appeal of the game opened arcade doors to a broader audience including younger children and girls. Without a doubt, the arcade culture became more inclusive thanks to Pac-man. Similar to the 80s arcade games, today’s desktop gaming alternatives are mostly aggressive. When my 6-year-old boy told me he was playing Five Nights at Freddy’s at his friend’s house I panicked and even felt helpless as I didn’t have an alternative to offer him. 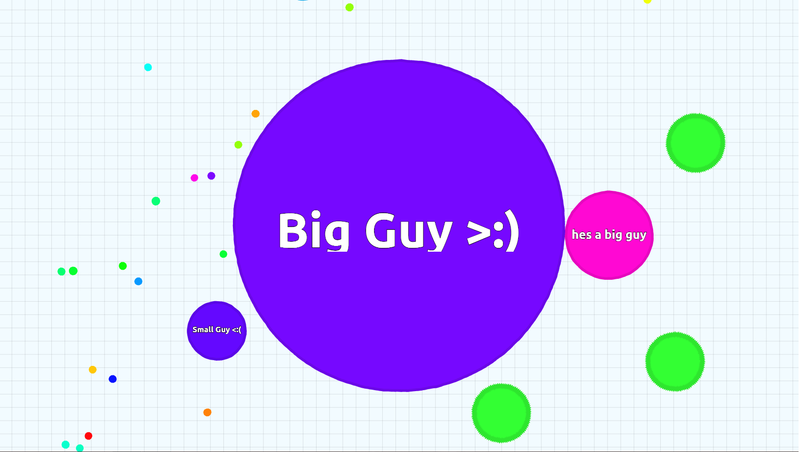 In the quest for finding a more wholesome game, I stumbled upon the TERRIBLY addictive browser game agar.io. agar.io, like Pac-man, is a simple game. You start as a blob, wandering around absorbing smaller blobs to grow. Larger blobs, likewise, tries to absorb you. It’s a familiar mechanism – eat dots, escape from being eaten, but agar.io strips it to the bare cell and pits you against others online. Pro tips: avoid the edges (too easy to get trapped), hit space to divide and lunge at smaller cells (but keep in mind this makes you vulnerable until you can merge back), and feed the spiky green viruses to explode your enemies so you can gobble up their chunks. Also, consider helping others by pressing W sharing some of your mass when they are in danger of being eaten by a larger cell – karma might come back when you are in a bind. Usernames can get a bit NSFW, so if you have kids, I advise you to uncheck the “show names” option.